But at the time the gun was forecast to go into Article 432, which later (and after many teething troubles) emerged as the T-64. Marshal Dmitriy Ustinov, then head of armaments, refused to permit any other tank to go into service before the T-64, so the Red Army was stuck. Their solution: get a “tank destroyer”. The Uralvagonzavod in Nizhniy Tagil had several prototype tanks and were able to modify Article 165, which had been a competitor with Article 430 (the predecessor of the T-64 design) to mount the new gun as Article 166. Little more than a lengthened T-55 chassis designed to mount a bigger turret, the marriage was successful and under the guise of a “tank destroyer” the T-62 was accepted for service in late 1961 and entered production in 1962. Ultimately more successful than the hapless T-64 (which was replaced by the T-64A in 1969 after an ill-starred career) more than 20,000 T-62s of all types were built. They generally were categorized as Model 1962 (early model engine deck and no AA MG), Model 1966 (late model engine deck) and Model 1972 (with an AA MG). The early models, like the T-55 Model 1958, did not have an AA MG as it was felt they were useless against jet aircraft. After Vietnam, the change back was due to the appearance of attack helicopters like the AH-1 Cobra. The T-62 initially scared NATO forces with its powerful 115mm smoothbore gun and APFSDS ammunition. But as intelligence worked on the problem they found out it had a number of serious drawbacks. Fire control was mediocre at best, accuracy of the gun was suspect, and if the semiautomatic ejector was working the tank could only get off four shots a minute, during which it was helpless due to the cycling of the device. 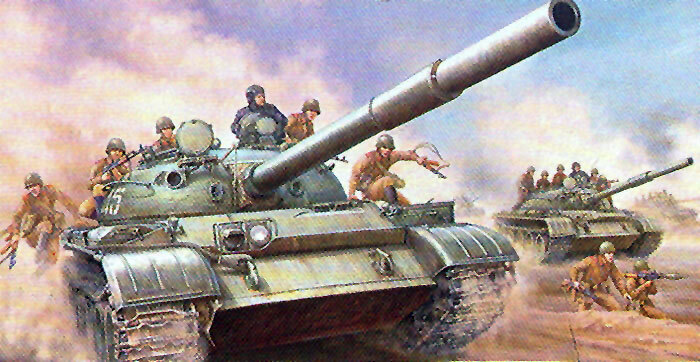 In 1977 Tamiya finally answered the fervent requests of modern Soviet modelers and released a kit of a T-62 Model 1972 tank as a “T-62A” (the actual T-62A was really the Article 165 tank with a rifled 100mm D-54TS gun, none of which appear to ever have been built in series). Hundreds of them began to appear on “threat” desks in the US Army and other NATO forces. But the kit was based on fuzzy photos of captured Syrian tanks and other details, and even with a book put out by Tamiya at the time on how to model the T-62 it was off the mark. Its major flaws were: wrong profile to turret, wrong hull shape, and suspension too low (it was apparently based on a burned-out Syrian tank and thus the weak suspension had it much lower than its actual 471.5mm ground clearance should have been (about 13.5mm in scale). Well, at least it kept the after-market boys in business! In 1992 I took it upon myself to built an Iraqi T-62 Model 1972 and with a good supply of Chesapeake Model Designs parts chopped a Tamiya kit to bits and corrected every one of its major flaws, which “Fine Scale Modeler” published in an article along with all of the templates needed to correct the kit. I decided it was way too much work and wanted to wait for a new kit that fixed most of the major errors. Finally, after about 18 months of anticipation, Trumpeter has answered my wish and is released not one but two brand-new T-62 kits – a Model 1962 as reviewed here and a Model 1972 with the AA MG. Both kits should carry the relatively correct details as the turret shell and engine decks are on a separate sprue and the hull is designed to permit drop-in replacement. 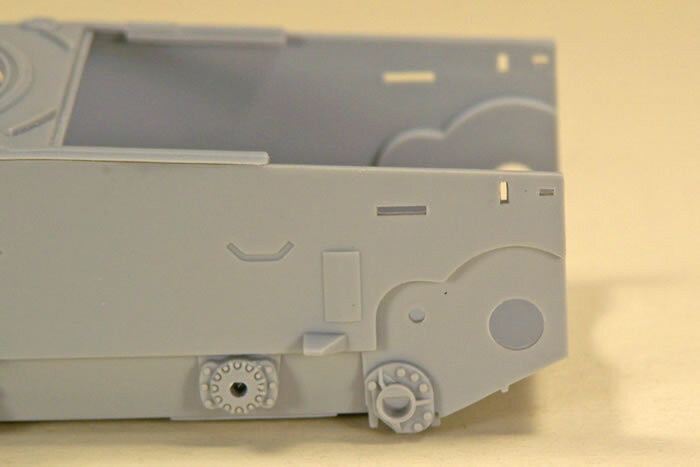 This kit is made to state-of-the-air standards and uses a large amount of “slide molding” for its components, especially the turret which now bears the proper undercuts along its front face. The hull is molded as a tub with torsion bar mount and belly pan details in place, and other details are present on the upper hull as well. The suspension is completely separate and provides for the “lever arm” shock absorbers, even providing special corner wheel sets for each one. 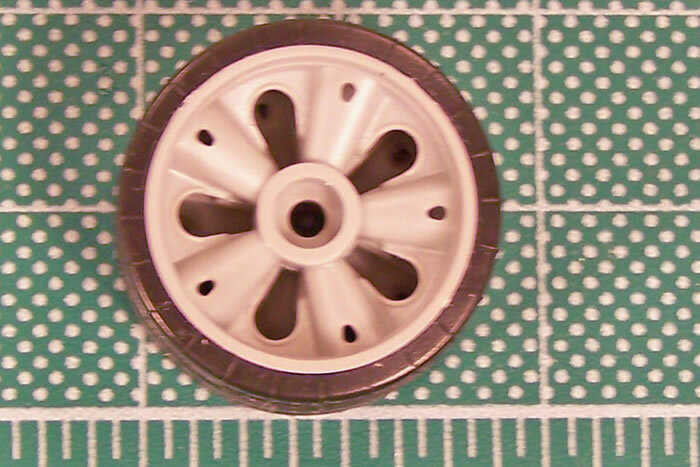 Each wheel has a separate tire in black styrene (NOT vinyl!) and creates a wheel unit with relatively accurate width. The tires bear the external mold markings found on some tires but are easily removed, but as with most round objects the tread face will need sanding or trimming as well. The “starfish” shape is pretty accurate and the wheels are index so they line up spoke in opening like the actual wheel sets. Tracks are the early OMSh (open metallic hing) type as used on the T-54 and T-55 but are correct for this version pre-rebuild. But they are single link (happily with nearly hidden ejector pin marks in the cast face) rather than link-and-length as with the KV kits. The turret is nicely done and all periscopes are provided as separate parts. 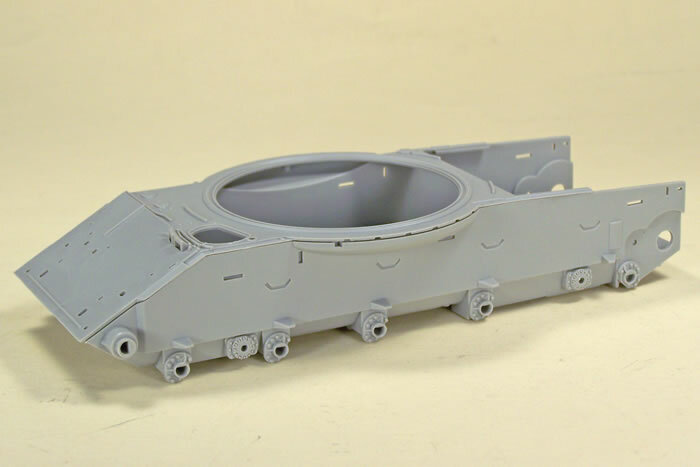 The modeler has a choice of a bare “pig snout” mantlet or one with a canvas cover molded in place, as well as a choice between covers or no covers on the gunner’s and commander’s search lights. 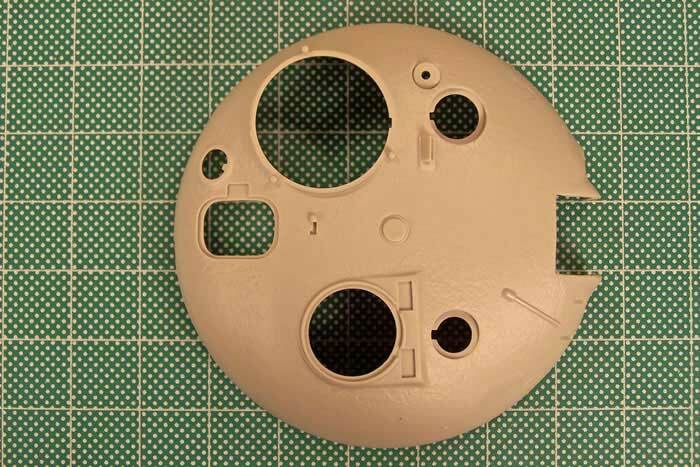 The modeler also has a choice between a turned aluminum gun barrel or a five-piece styrene one with a “slide molded” bore, both of which then take an etched brass ring with the bolt heads on the bore evacuator. However, the muzzle depth is not wide enough; the opening is correctly gauged at 115mm (about 3.2 mm) but somebody did not realize the cap on the muzzle is designed to protect the muzzle crown and is much larger (about 135mm). While this is easy to fix with the styrene barrel, it will be tedious with the aluminum one. But. There is always a but, and this kit unfortunately has a few. There are two major ones which have come up on the Internet and are not without foundation. First off, the turret loader’s hatch is skewed inward when viewed from above. Since most blueprints of T-62s show this hatch to have its hinge line parallel to the cross-section of the tank, many have yelled foul. I took a good look at all of my references, and frustratingly there actually are a few cases where it seems this is so. One set of two photos from the UVZ factory museum shows a tank with the same turret (the Article 166M or “T-62B” prototype) shot dead on with the inside of the loader’s hatch clearly visible from the right side and the outside from the left, which would be correct if the hatch was skewed as in the kit. It is not known where Trumpeter got their information from, as the Chinese have an early model T-62 they captured at Daiman Island on the Ussuri River in 1969. (This was reverse engineered to create the prototype WZ-122 medium tank, which did not go into PLA service.) It is possible some early tanks could have this variation, but for the most part it appears that the hatch should be square on. The other major problem is at the rear of the hull. 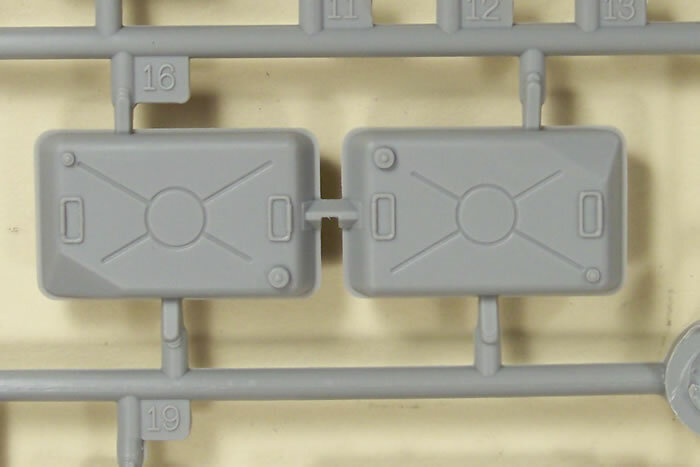 Tamiya missed the fact that the entire engine deck of a T-62 slopes downward at 4 degrees, and that the rear of the hull joins it at a 90 degree angle (e.g. 86 degrees from horizontal). Trumpeter has the rear of the hull at 90 degrees to the ground surface line. The solution will have to be adding 0.080 x 0.040 inch strips (2mm x 1mm) to the rear of the hull and sanding them down to form a wedge that will permit meshing with the lower hull joint, plus shim or extend the engine deck to fit. The rest of the points are mostly minor. Trumpeter has the weld bead where the lower and upper glacis joint present, but it is a bit thick and inexplicably stops before it reaches the side of the hull. Also there is no heat shroud between the oil tank (B-10) and the exhaust outlet (C-6). Etched brass covers most of the parts modelers need, such as the safety mesh over the engine radiator air intake and exhaust and some of the minor bits. Decals consists of a number jungle with Guards badges and also two specific tanks, number 953 with a truncated pyramid and dot marking and number 519. A color broadside is included for number 953 along with recommended color matches for Mr. Hobby, Model Master, Tamiya and Humbrol. Overall this kit is a vast improvement over the Tamiya kit, and anyone wishing to build one should start here and NOT with the Tamiya kit no matter how cheap it is (about $5-10 at shows is not uncommon). But it does have some flaws which make it just miss a “Highly Recommended” rating. Thanks to Mike Bass and Laura Carney of Stevens International for the review sample. – 10 Etched brassThanks to Ed Sexton of MRC for the review sample.